The pinnacle of your overall fitness “Your Lower Abs” is mostly untouched by traditional core exercises like crunches, bicycling etc. If you are really looking for a flat and sculpt belly, you need to make sure that you work on every single bit of these hidden muscles. Lower abs is like the final gem on the treasure of your six-pack or maybe eight-pack of abs. No matter which fitness program you follow, the lower abs are the last ones to get toned and first ones to gain fat (even if you slip diet by just a little bit). Fortunately, the following set of lower Ab workouts are there to ease up this taunting task for you. Start this Lower Ab Workout lying flat on your back on the floor and place your hands under your buttocks to produce a deep stretch. Try to contract your lower abs while tightening your core as well. Now raise your legs perpendicular to your stomach (initial Position). Without bending your legs, start squeezing your lower abs and buttocks and push your legs directly upwards, using your hips. This now is a “pulse”. Hold this position for half of a second and then lower down slowly, allow your hips to briefly touch the floor. Now repeat the pulse to complete one rep. You can perform as many as 12-15 reps in one set. Lie down flat on your back while keeping your legs in a tabletop position (initial position). Contract your lower abs while keeping your upper back as neutral and as stationary as possible. Now start lifting your hips off the floor in a manner that you also pull your knees inwards (toward your head) simultaneously. Take a half second pause when your knees reach your chest height and then slowly move back to the initial position. Try to complete 15-20 reps every day. Once you are comfortable with it, try it with a light dumbbell between your legs to raise the difficulty level. 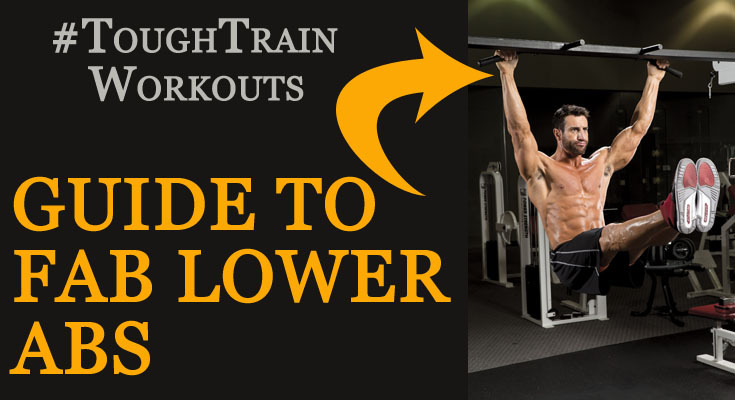 This Lower Ab Workout is an advanced exercise and beginners are suggested not to try this one until they feel expertise in the above two workouts. Now, coming back to Hanging Leg raises, you need to begin this thing with hanging from a horizontal or a pull-up bar with your hands placed at the shoulder-width on the bar (initial position). Make sure you keep your back as straight as possible and start contracting your core and lower abs and slowly raise your legs until they are in a position parallel to the floor and keep yourself as steady as possible for half of a second. Now slowly return to your initial position and this completes one rep. you can do 12-15 reps and once you start feeling expertise in this sort of motion, you can raise your difficulty by gradually taking your legs from parallel to the floor to over the bar position. This little Lower Ab Workout leaves large results. Start with your body being in an elbow plank position on the floor and both hands holding each other (fingers between the fingers) and feet being little wider than the hip width (initial position). Now start to slowly step foot by foot (max. 2 steps on each leg) towards your elbows, raising your hips and lower back. Now slowly step back in a manner exactly reverse to which you moved forward in, until to get back to the initial position, this completes one rep of the workout. You can do 2- 3 sets of reverse elbow plank with each set containing 3-5 reps.
Start in a standard Crunching position by laying flat on the floor and your hands behind your head. Make sure you don’t drag your head and neck while crunching, let the muscles work. While bending your knees to a 45-degree pull those upwards until your calves get parallel to the floor. Pushing the minimum surface area of your back into the floor, try to lift your shoulder off the floor. While keeping one of the knees bent, straighten the other one and hold it at an elevation of 450 in the air; simultaneously, lift and twist your upper body so that the elbow opposite your bent knee touches the bent knee. Don’t be afraid if your elbow doesn’t touch the bent knee very initially, actually it’s the twist in your upper body that matters. Now bend the straightened leg and twist the upper body in reverse direction to touch the other elbow to the knee on the other side of it.